TomTom RIDER 410 World is a motorcycle satnav with a 4.3-inch touchscreen. There are two models to choose from which are either Lifetime World mapping (preloaded with 45 European countries and other world countries are free to download). The other available option is Full World mapping with Car Mounting Kit, Anti-theft Solution and Protective Carry Case. It is built to withstand all weather conditions. If you buy a compatible Bluetooth Headset you will receive hands-free navigational instructions via bluetooth. Lifetime Traffic Information is provided which will route you around traffic congestion. Furthermore a speed camera locations database is provided for the lifetime of the TomTom Rider product. Also plan your route before you travel with MyDrive and Tyre Pro. Bluetooth file sharing between TomTom devices is also possible. 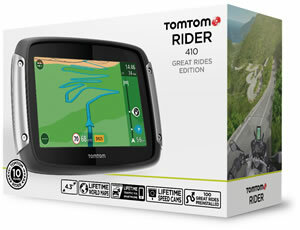 TomTom RIDER 410 has been discontinued. 1. 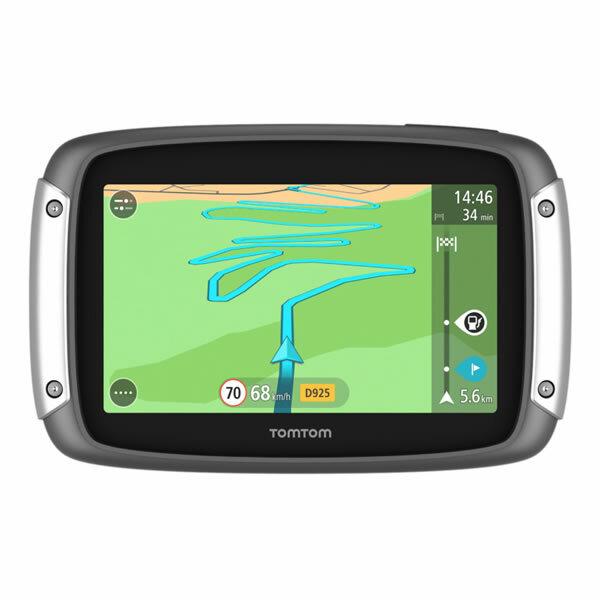 TomTom RIDER 410 World with 45 European countries preloaded with the option to download further world country mapping free of charge from TomTom. 2. TomTom RIDER 410 World with 45 European countries with the option to download further world country mapping free of charge from TomTom. PLUS includes Car Mounting Kit, Anti-Theft Solution and Protective Carry Case (as pictured below). 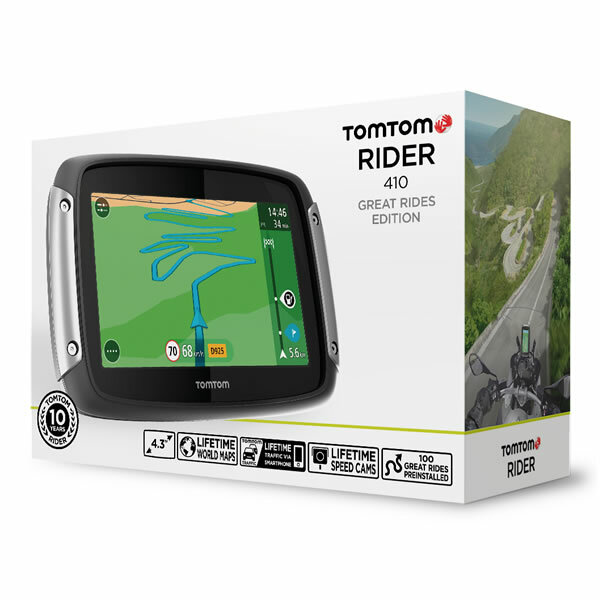 TomTom RIDER 410 motorbike satnavs include 4.3-inch touchscreen and has also been designed for use in all weather conditions and it is waterproof to IPX7 standards. You can view the route ahead in either landscape or portrait mode. The Portrait mode shows more information about the road ahead. Audio navigational instructions are provided via Bluetooth enabling you to keep your eyes on the road. You will need to buy a separate Bluetooth Headset to work with your TomTom satnav system as this is not supplied in the box when purchasing. You can also make hands-free calls via bluetooth using this TomTom RIDER 410 bike satnav. Lifetime Traffic information is supplied with the TomTom 410 WORLD for the lifetime of your device. This will ensure that you will always be routed around traffic jams. A speed camera locations database is available for the lifetime of your TomTom motorcycle satnav product. You will know where the fixed and mobile speed camera locations are which will help to protect your driving licence. The speed camera coverage includes 36 countries across Europe. Updates are available in real-time and twice weekly via MyDrive Connect and TomTom HOME. If you buy a Full WORLD Mapping model speed cameras are included for the lifetime of the product. MyDrive feature allows you to plan routes on a Smartphone, Tablet, PC or Mac computer. You can then send the journey to your satnav. Additionally, you can view real-time traffic information before using your satnav. Favourites and POI's can also be managed using MyDrive Feature. Tyre Pro feature allows you to plan a route on your PC Route with multiple stops along the journey. Create and edit routes on your computer and share routes with friends via Bluetooth. MyDrive is Windows and Mac Compatible. Tyre Pro is only Windows Compatible, not Mac Compatible. Cardo Scala Rider headsets are available to pair with your TomTom Rider 410 World. The benefits of buying and using a Scala Rider headset with your TomTom Rider 410 World are three-fold; 1. you can listen to sat nav voice turn-by-turn instructions, 2. listen to music and 3. communicate with other motorcyclists whilst riding (using the intercom when within range and mobile phone when out of range). ‣Displays your route, current speed, time of arrival, name of current street and it can also display points of interest such as food, fuel and cash machines. The TomTom RIDER 410 includes everything you need to mount and install it on the handlebar of most motorbikes. Included when you purchase from ActiveGPS is a RAM mount designed to attach onto the handlebar of your motorcycle. Once this is fitted, a unique TomTom RIDER 410 motorcycle mount which is also included can be fitted to the RAM mount. You're then ready to ride with the TomTom RIDER 410. A car kit is available separately. It is also included when buying the Premium Pack. Simply position the automotive mount on your vehicles windscreen using the suction cup mount and power via your vehicles cigarette lighter adaptor with the High-Speed Dual Charger and you are ready to use the motorcycle sat nav in your car. Want to add accessories to your TomTom RIDER 410 model? We sell genuine TomTom parts and accessories including the replacement battery cable and replacement motorbike mount with battery cable.